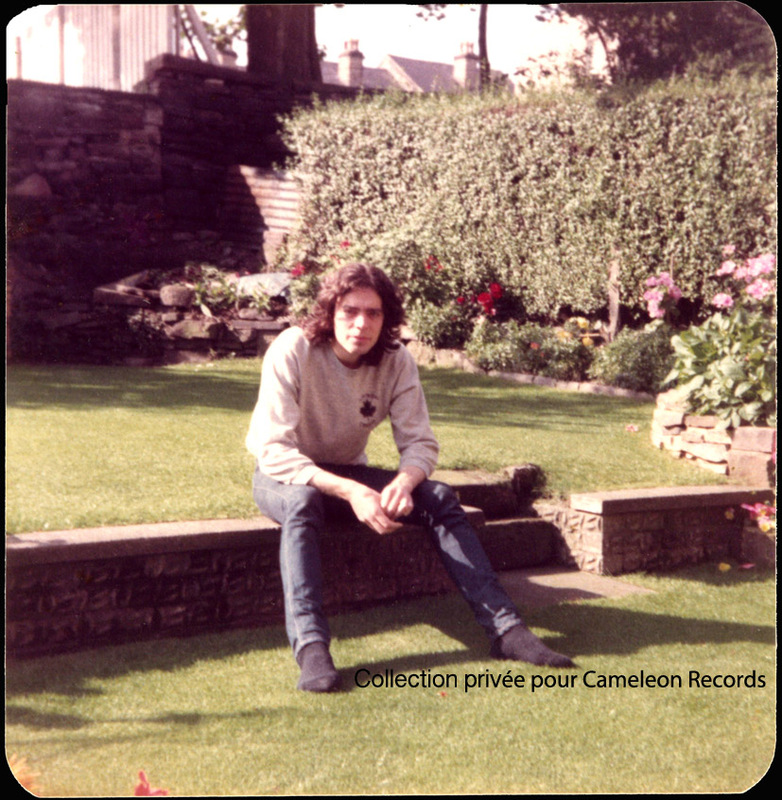 Hello, welcome to Cameleon Records, a division of VinylVidiVici Rds, whose goal is to reissue previously published LPs or unreleased tracks, but not found or too expensive. Punk, hard, garage, new wave, soul, folk .... just listen dominant in the choice. !!! SATURDAY 13 TH 2019 !!! Huddersfield is a city of the United Kingdom, located in the west part of Yorkshire, in the north of England, surrounded by Manchester, Leeds and Sheffield. It is in the metropolitan district of Kirklees, near the confluence of the Colne and the Holme rivers and has about 162 950 inhabitants. Mirfield is a small English town also part of Kirklees. It is located on the main road between Huddersfield, Dewsbury and Wakefield and has 18 620 residents. The closest train station is Mirfield. What was later discovered is that ROBERT HINCHLIFFE was born in 1954 in England, his father playing the piano and his mother a classical music enthusiast. As a young man, he learned to play the guitar by himself, listening to a lot of different artists from DJANGO REINHARDT to FAIRPORT CONVENTION. He finally took a few lessons from a FRANK WHITE, blues guitarist based in Sheffield (see here). 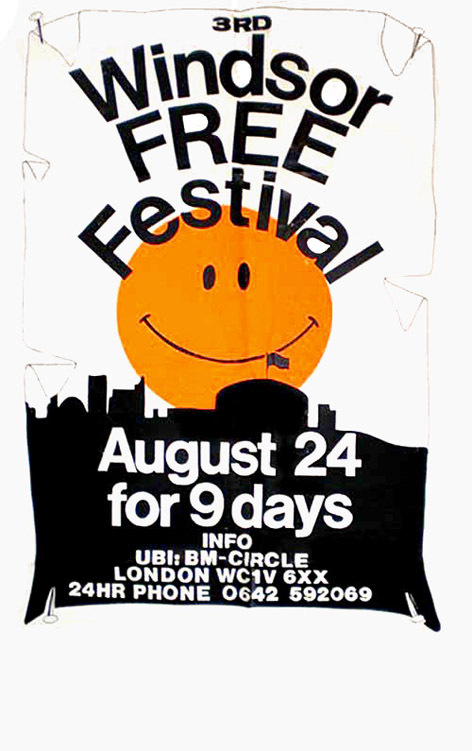 As far as playing in front of an audience, ROBERT HINCHLIFFE appeared at the free festival of Windsor in 1974 (along with GONG, FLEETWOOD MAC, WITCHES BREW, BLISS...), and also played at a number of pubs and folk clubs around England, including the Top Spot Snooker Club in Huddersfield where he still plays these days, and where he was finally unearthed. He also managed to perform on stage on the other side of the pond, in Miami, Florida and in Floyd, Virginia. HINCHLIFFE recalls playing with various drummers (Gary Goode, Steve Hawkins, Martin Hunt), bass players (Gary North, Dave Mallick), the pianist John Greeney, guitar player Pete Billington (nowadays in The Simon Lasky Group), and vocalists Deborah Hasham and Marie Appleyard. Hinchliffe himself did a lot of sessions for others as a guitarist, in a few different local studios such as Fairview Studios near Hull and the Leader Sound Studio in Elland (near Huddersfield) where he also recorded a few of his songs in 1979. The drawing appearing on the sleeve made for the acetate in 1976 was the work of Robert's uncle, Walt Whitworth. In the early 80's, he formed The Crying Gypsy Café with three other musicians from Sheffield, playing his own songs with an electric band. 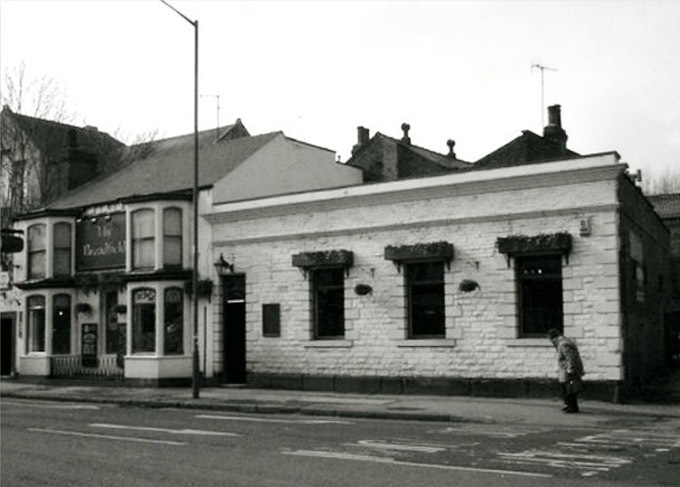 They played often in town, appearing regularly on stage at the Broadfield Pub. He then formed a duet with a saxophonist, Cut Loose, playing an odd blues-based music. These days, ROBERT HINCHLIFFE still performs between Huddersfield and Miami! 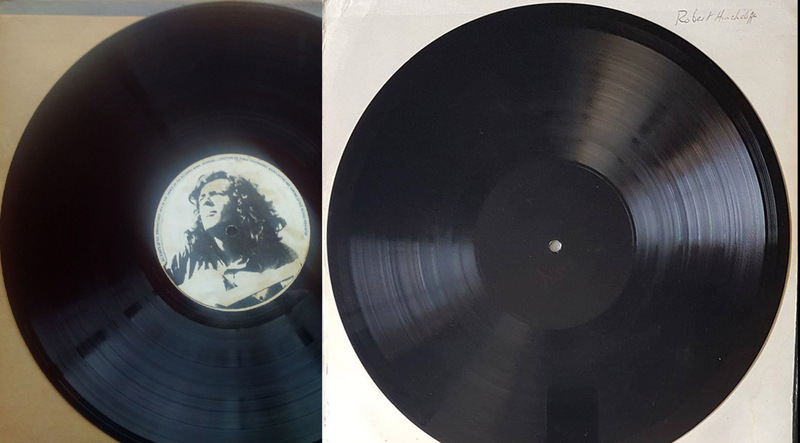 Another copy of the acetate is still in the family collection, but Robert doesn't remember any other copy being made. Released by Cameleon Records in a limited edition of 500 copies, this vinyl project has been made possible thanks to the precious help of René Debot, and to the meticulous restoration work of François Terrazzoni at Studios Parelies. It took 16 whole hours to reach a satisfying remastering, knowing that we had chosen to keep the recording as rough as it had been taped, without changing its general mood, or correcting any of the original flaws of the homemade 2-track session. I hope this choice will satisfy those who had been long time fans of the tracks already available on Youtube. I wish to thank René Debot, Quentin Orléan, Olivier Fertel, François Terrazzoni, Laurent Bigot, Marion P, Nathalie, the city halls of Mirfield and Huddersfield, the websties of all the cities, pubs and clubs I got in touch with, S. Hawkins, Jane Hinchliffe and all the Hinchliffes living in Yorkshire that answered my phone calls and messages. 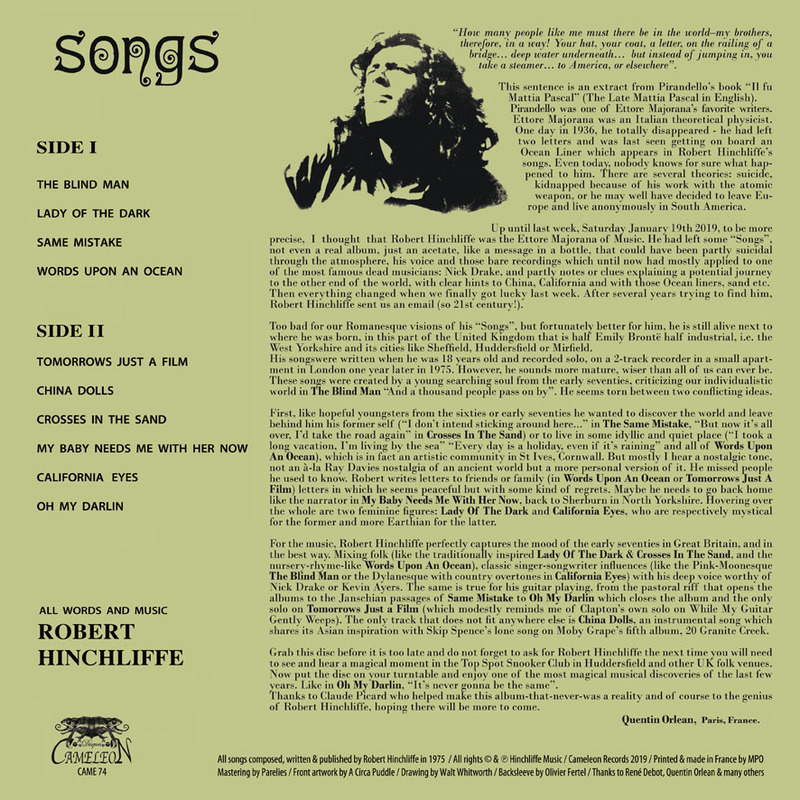 To dig or at least feel Robert Hinchliffe's folk songs, one just needs to read the liner notes on the back of the cover, from the hand of the lucky one who first heard from Robert Hinchliffe after all hard work to track him down. Thank you Quentin.
" how many people like me must there be in the world–my brothers, therefore, in a way! Your hat, your coat, a letter, on the railing of a bridge… deep water underneath… but instead of jumping in, you take a steamer… to America, or elsewhere"
This sentence is an extract from Pirandello's book "Il fu Mattia Pascal" (The Late Mattia Pascal in English). Pirandello was one of Ettore Majorana favorite's writer. Ettore Majorana was an Italian theoretical physicist. 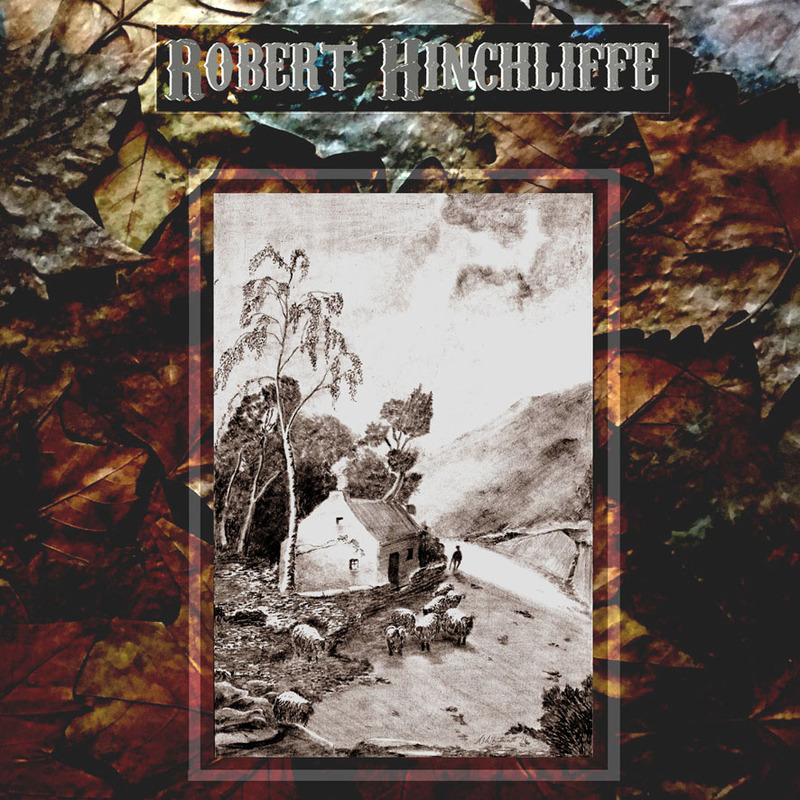 One day in 1936, he totally disappeared (he left two letters, and the last time he was seen was when he embarked on a boat, an Ocean Liner – which makes apparitions in Robert Hinchliffe's songs). Even today, nobody knows for sure what happened to him. There are several theories: Suicide, kidnapped because of his work with the atomic weapon, or maybe he just decided to leave Europe and live anonymously in South America. Up until last week (Saturday January 19th 2019, to be more precise), I found that Robert Hinchliffe could be a kind of musical Ettore Majorana. He left us some "Songs" (not even a real album, just an acetate, like a bottle in the ocean) that could have been part suicidal (the atmosphere, his voice and that bare recordings mostly applied to one of the most famous dead musicians: Nick Drake), part notes/clues explaining a potential journey to the other side of the world (with clear nods to China, California and with those Ocean liners, sand etc…). Then everything has changed when we were finally lucky last week. After several years trying to find him, Robert Hinchliffe sends us an email (so 21st century!). 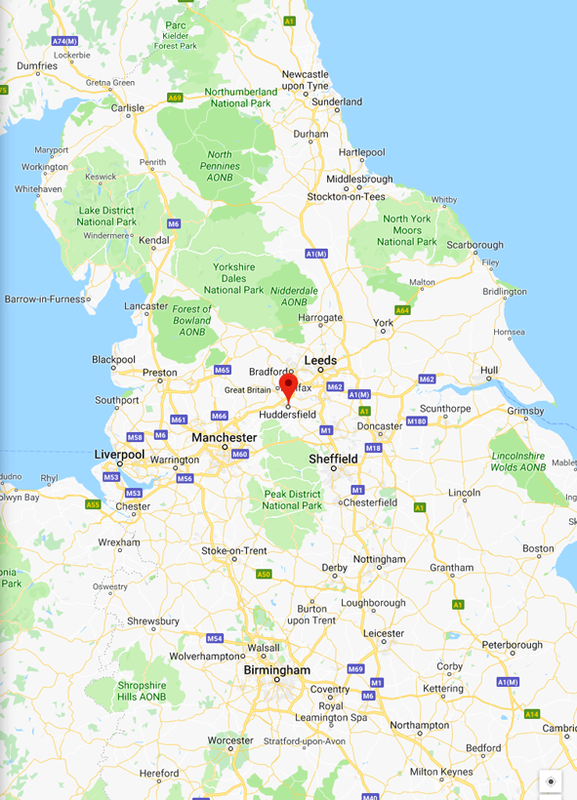 Too bad for our Romanesque visions of his "Songs", but hopefully better for him, he is still leaving near where he was born, in this part of United Kingdom half Emily Brontë half industrial, the West Yorkshire and their cities like Sheffield, Huddersfield or Mirfield. They were written when he was approximately 18 years old and recorded solo, on a 2-track recorder in a small apartment in London a year later in 1975. However, he sounds more mature, wiser than all of us could ever be. These songs were created by a young searching soul from the early seventies (making critics of our individualistic world in Blind Man "And a thousand people pass on by"). He seems torn between two opposite ideas. First, like young hopefuls from the sixties or early seventies he wants to discover the world, leave behind him his former self ("I don't intend sticking around here.." on The Same Mistake, "But now it's all over, I'd take the road again" in Crosses in the Sand) or live in some idyllic and quiet place ("I took a long vacation, I'm living by the sea" "Every day is a holiday, even if it's raining" and all of Words Upon an Ocean), which in fact is an artistic community in St Ives, Cornwall. But mostly I hear a nostalgic tone, not à-la Ray Davies (nostalgia of an ancient world) but more personal. He missed people, people he used to know. Robert writes letters to friends or family (in Words upon an Ocean or Tomorrows Just a Film) where he seems peaceful but with some kind of regrets. Maybe he needs to go back home like the narrator in My Baby Needs Me With Her Now, back to Sherburn in North Yorkshire. Hovering above all are two feminine figures: Lady of the Dark and California, who are respectively mystical for the former and more Earthian for the later. 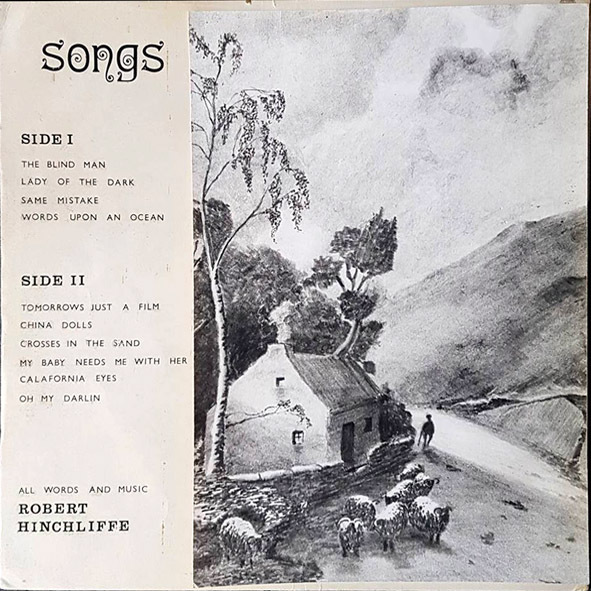 For the music, ROBERT HINCHLIFFE perfectly captures the mood of the early seventies in Great Britain, and in the best way. Mixing folk (like the traditional inspired Lady of the Dark & Crosses in the Sand, and the nursery rhymes-like Words upon on Ocean), classic singer-songwriter influences (like the Pink-Moonesque The Blind Man or the Dylanesque with country overtones California Eyes) with his deep voice worthy of Nick Drake or Kevin Ayers. The same is true for his guitar playing. From the pastoral riff that opens the albums to the Janschian passages of Same Mistake or Oh My Darlin which closes the album and the only solo on Tommorows Just a Film (which modestly remind me of Clapton's own solo on While My Guitar Gently Weeps). The only track that does not fit anywhere else is China Dolls, an instrumental song which shares its Asian inspiration with Skip Spence's lone song on Moby Grape's fifth album 20 Granite Creek. Grab this disc before it is too late and do not forget to ask for ROBERT HINCHLIFFE the next time you will need to see and hear a magical moment in the Top Spot Snooker Club in Huddersfield and other UK folk venues. Now put the disc on your turntable and enjoy one of the most magical musical discoveries of the last few years. Like in Oh My Darlin, "It's never gonna be the same". Thanks to Claude Picard who helped make this album-that-never-was a reality and of course to the genius of ROBERT HINCHLIFFE, hoping they will be more to come. There are 15 copies for the pressing test. Handmade sleeve, with real leaves glued and varnished, numbered and stamped.